…”I am sorry that your mother is not well and I trust that ere this she is in health and spirit what you would have her be. Have seen several people from Indianapolis whom I know among them were Drs Hummons & Atkins who were in Detroit the other day enroute to Niagra Falls and Toronto. To see them come and go makes one homesick. Sweetheart is real late and I m tired and sleepy will write you a long sweet letter next time. 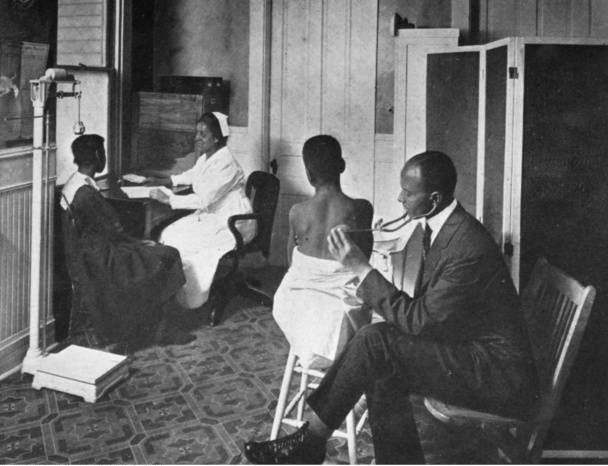 Dr. Henry Hummons examining a patient at Flanner House. 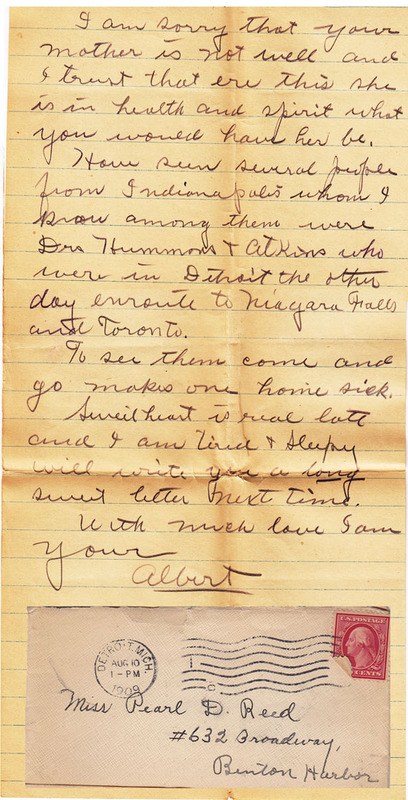 In this letter Albert wrote to Pearl in Benton Harbor, MI, where she has gone for a summer visit. Two of her older sisters, Sarah Reed Busby and Louise Reed Shoemaker lived there with their families. Dr. Henry L. Hummons was about 10 years older than my grandfather and a leader in Indianapolis’ black community. He had attended Knoxville College, as did my grandfather and also graduated from Indiana Medical College, which my grandfather was attending. Dr. Hummons had set up his practice in Indianapolis. He took a leading role in starting Witherspoon Presbyterian Church, of which my grandparents and my grandfather’s brothers were founding members. He and my great uncle, Henry Cleage, were leaders in the campaign to get a black YMCA in Indianapolis as the white ones were not integrated. His name appears in several of my grandfather’s later letters. You can read more about him in the obituaries below. “Dr. Henry Lytle Hummons (M.D., Med. Coll. Ind. ’02) of Indianapolis, Indiana, died on April 5, 1956 after a prolonged illness. He was 83. Dr. Hummons was born in Lexington, Kentucky on February 25, 1873, the son of Thomas and Mary Ellen Hummons. 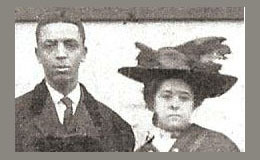 He received his early education in the local public schools and graduated from Knoxvillle College in 1896. In that year he came to Indianapolis, and later entered the old Medical College of Indiana from which he received the M.D. in 1902. He served an internship in Shelbyville Hospital in 1903 and entered practice in Indianapolis in that year. Ask the family elders, they know something. Dr. Hummons sounds like he was a very accomplished man. As usual, love seeing the actual letters hand-written. I love his charming handwriting. How cool that you were able to track down information on the doctor, as well! Amazing what a google search will turn up. I had also looked through many Indianapolis newspapers while researching my family and his name turned up over and over. Love the history. The handwriting reminds me of my maternal grandmother. Wonderful story Kristin! it’s so great that you have letters that your grandparents wrote. Great piece of history! Thanks Josna. Sometimes I wonder if finding the back story is worth the time, but I am always glad I did. Once I start, I just find more and more. Done well! You’ve got a book in you! Kris…I can’t remember if they were married at this point? Im sorry I forgot. I know there was a triff abt Pearl’s mother. I love his sentiments so gentle to her. I can’t wait for your book. You are so Gifted. I really appreciate you telling their stories and artifacts. Great Job! True! They won’t be married until W, which will be for wedding. As long as the envelopes show the letters being sent to Miss Pearl Reed, you can be sure they aren’t married. After they are married he addresses them to Mrs. Pearl Cleage. Thank you so much for including my grandfather, Dr. Henry L. Hummons , in your A-Z Challenge. Another granddaughter, Ann Hummons Powell, found this blog and sent it to all of us grandchildren. I am the daughter of Helen Hummons Anderson, Henry’s only daughter. Ann is the daughter of Henry Hummons, Jr. and David Francis Hummons and Patricia Hummons Powell are the children of Dr. Francis Hummons. I knew my grandfather very well. He talked about your great uncle, Henry Cleage, quite often and the history of Witherspoon Presbyterian Church and the Senate Avenue YMCA in Indianapolis.They helped to build institutions which played important roles in the African American community in Indianapolis. They left us quite a legacy. Yes they did! I’m so glad your family found the post and enjoyed it. I was in Indianapolis several years ago looking through newspapers and found many mentions of your grandfather, my grandfather and Uncle Henry.